Both Plastic Air Valves (PAV) and Stainless Steel Valves (SSAV) have the same functions as the metal ones. They are designed to offer simple but effective means of providing air supply and air extract for most commercial, industrial and domestic ventilation applications. The only differences in contrast to metal valves are materials used and their construction. 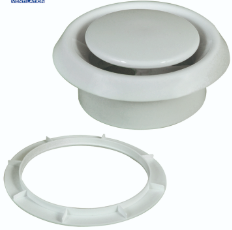 The plastic air valves and the stainless steel air valves can be used for both air supply and air exhaust (2 in 1). What are Plastic /Stainless Steel Air Valves Made Of? 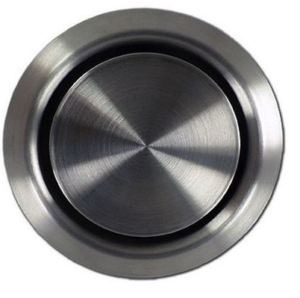 Stainless Steel Air Exhaust and Supply Valves (SSAV) are made of stainless steel 304 with a brushed finish. The wide edge evens out potential bumps on the wall or diameters of the opening. The construction of this model also allows the possibility to be inserted into pipes that are plastered too deep into the wall. Many HVAC accessories & custom metal stamping parts manufacturers and suppliers exist on the market today. Offering products from iris dampers, metal disc air valves, ventilation pipe clamps and duct suspension clamps, to duct access doors, tabbed access doors, damper regulators and more. Unlike other suppliers, Ningbo Aier Ventilation Equipment has several crucial advantages in its assets. For example, we have established our own in-house metal stamping workshops which means that we have full control over our production and quality of our products. Furthermore, we have built our own production lines for plastic injection and plastic extrusion (10 sets×plastic injection machines and 2 sets×plastic extrusion machines). These production lines are mainly used to produce the plastic air valves and many other plastic accessories such as the washers (for holders); handles (for iris dampers); knobs (for access doors); and rubber lines (for pipe clamps). Besides, we are the best at and most proud of our production lines for metal stamped ventilation accessories such as the metal air valves, iris dampers, access doors, pipe clamps, swirl diffusers, etc. With over 20 years of constant development and growth, we are now one of the biggest manufacturers of ventilation accessories in China.